Reference 1680 was introduced in 1966 and had the chronometer status and a date display. This watch also introduced the Cyclops date magnifier to the Submariner line. The crystal that is used on this watch is very "high" - not domed like it was normal on eg. 5513 and 1665. It stands almost 3mm above the case and bezel, making it very unique and easy to recognize. I personal did'nt think this was very practical, the high plexi glass would attract ding and dongs, and easy get scratched. This was the reason that I did'nt find this model very interesting in the start. But now this feature is what I like about the watch and what makes it special for me. The price of the model 1680 with red writing - also known as the "red submariner" has seen a dramatic increase in the last years following the the price rise of the Double Red Sea-Dweller. The price will continue to rice for the specimen's that can be proved to be original. Lately many fake red submariner has been seen, and some collectors even see the white 1680 as more real and a better investment because this model has not been seen as fake so far. Some "fake" red submariners is generally a real white submariner where the dial has been replaced with a dial with red writing, making it a real Rolex - but a "fake" red submariner. I'm looking for a "real" red submariner - preferably a red 1680 with the 200m=660ft dial writing. But has so far "only" achieved a real nice white 1680 from a other known collector. It's a nice addition to my current collection, and so far I'm more than satisfied with this model as part of my collection. 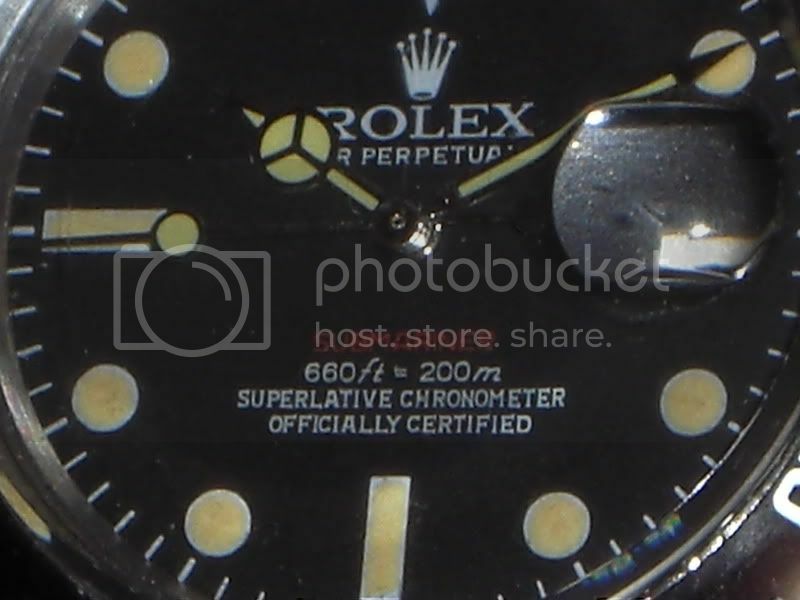 My Rolex Date Submariner 1680 was the one that I somehow felt was missing from my collection as the 1680 Date sub is the link between the original Rolex Submariner (in general the 5513 non date) to the modern Date Submariner (model 16610). I was so lucky that I was able to get a pristine example with the original Box and brochure included. Its becoming more and more difficult to find nice examples of vintage watches which has some of the original box and papers included. But with this white 1680 I feel that my "collection" has become more complete. Please check the "My next Watch" to see what I feel might be the next addition to my little collection. Launched in 1966. Depth rated to 660 ft (200m).Depth rating printed on dial. Chronometer. New 1575 Chronometer movement with Date. Raised and flat crystal. Submariner printed in red. Updated in 1972. Depth rated to 660 ft (200m). Crown with triple-lock. Depth rating printed on dial. Chronometer. 1575 Chronometer movement with Date. Raised and flat crystal. All dial lettering printed in white.